Welcome in the land of the hummingbirds ! 1 NIGHT booked = 1 TREE planted* ! Somewhere in Guadeloupe, in a small village called Deshaies, there is an intimate place with a well-preserved nature. Only a few minutes away from the most beautiful beaches, some privileged people can stay in a treehouse, wooden creole hut, Charming villa et charming cottage. 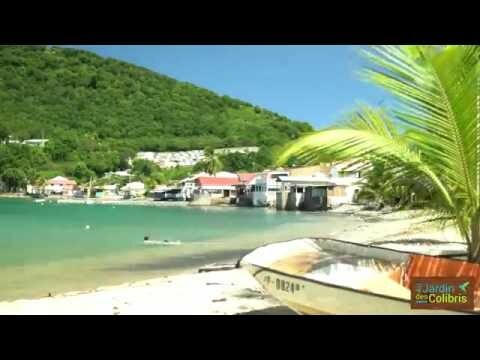 Deshaies is a village situated in a fantastic bay in front of the Caribbean Sea. As it is far away from beaten tracks, it is the ideal place to welcome someone who is an amateur of authentic vacations. The most beautiful beaches are only a few minutes from the accommodations, with fine sand and coconuts trees at La Perle, Leroux, Riflet… and of course the famous beach of Grande Anse. The national park of Guadeloupe is very close as well and the underwater diving around Deshaies is absolutely fantastic! And if you wish to see some turtles close to the beach… It´s possible! *Au Jardin des colibris is the partner for reforesaction to plant a cocoa tree in Haiti to struggle against deforestation and to build an organic cocoa sector. When you spend one night or more with us, you’ll receive a code to plant your tree in Haiti! To prepare your travel is already traveling…. We propose many different discoveries, with a wide selection of excursions, tracks and personal favorites that the entire team of Jardin Des Colibris has experienced for you! Around the charming cottages in Deshaies, in the Caribbean coast, the choices are many: very fine sand during several kilometres, diving with or without diving equipment in a tropical aquarium, secret waterfalls and fields drowned in flourishing forest, the botanical garden, small islands with only white sand, the discovery of the mangrove in kayak, encounters with whales, dolphins, and cachalots … Furthermore, the life in Deshaies is where the fisher sells his captured fish on the street, stands with a selection of tropical local fruits, dinner tables with an exceptionally beautiful sea view or why not bring a take away plate that you can peacefully enjoy on the terrace of the tree house , wooden creole hut, Charming villa et charming cottage . As you see, Deshaies is ideally located on Basse-Terre and is worth taking your time to visit!